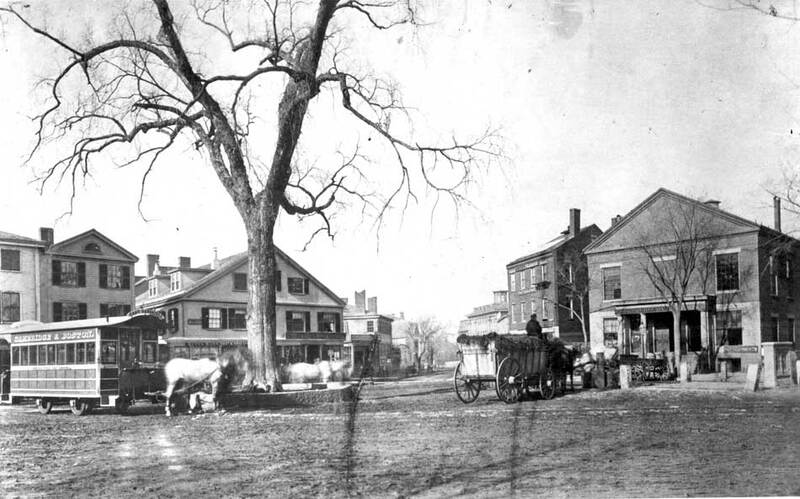 Harvard Square, c. 1865. Willard’s Hotel is just barely out of view to the left. Identifying such a place as I’ve mentioned in the title could be the subject of much debate. Transcendentalism was, after all, hardly a cohesive “movement.” Those whom we call Transcendentalists were a complex bunch moving in many different directions. One could point to a number of different ministers, writers and reformers and say that he or she began the movement in this church, or that lecture hall, or so-and-so’s parlor. But there was a key meeting to which many historians point when discussing the beginning of the Transcendentalist movement. It took place on September 8, 1836 on the day of Harvard College’s 200th anniversary celebration. It was a momentous day for the College, full of dignity and decorum. At 10 o’clock, the throng of more than 1,100 alumni gathered by University Hall. The oldest alum, 96 year-old Judge Paine Wingate, (class of 1759!) was unable to attend, but he was later honored by a toast from none other than Senator Daniel Webster. After the church service, alumni paraded across Harvard Yard to a great pavilion and amphitheater which had been set up for the occasion (Widener now occupies much of the site). During dinner, many speeches were given. And then there were toasts, and toasts and more toasts. So many individuals, possibly motivated by the free flowing wine, lined up to give toasts that college President Josiah Quincy had to cut off the festivities at 8 o’clock as it was growing dark. At some point during all this pomp and circumstance, four of the attendees grew tired of the proceedings. Amid all this droning retrospection, they desired some conversation that was new, revolutionary, deeper and broader. And it wasn’t just the conversation of the day that they found tedious, but the entire atmosphere that pervaded Harvard. The intellectual climate there had grown stale and resistant to new thinking. The four companions left Harvard Yard, crossed Harvard Square and sat down in Willard’s Hotel. The building stood on the west corner of Dunster Street and Harvard Square. Built in 1797, it was a landmark. Most knew it as the site for the purchase of stage coach tickets to Boston (some irony there in that the entrance to the Harvard T station now sits right in front of the site). “This building,” wrote historian Duane Hamilton Hurd in 1890, “was of two stories, gambrel roofed and of hospitable aspect, with a more modern hall for dancing attached, the great place for public gayeties in our boyhood.” It was, he said, “the resort of the moderns—i.e. the less ‘advanced’ people.” That is, I think, to say that it was the hang-out of a younger generation. The four sat down and began to discuss the discouraging state of thinking in Cambridge and indeed in America at large. All four were young men, each of them struggling with conventional ideas on religion and philosophy. Three of them were ministers and the fourth had been a minister but resigned a few years prior. Some of them, quite recently, had been writing groundbreaking works, defying convention. Their conversation soon turned to the concept of organizing a series of symposia, or a club…or something…that would be devoted to discussion and debate on new thinking. The eldest was Rev. George Ripley. 34 years old at the time, he was born in Greenfield, Massachusetts. He graduated in Harvard’s class of 1823 and went on to graduate Harvard Divinity School in 1826. The same year he was ordained as minister of Boston’s Purchase Street Church. Just a few months prior, he had published “Schleiermacher as a Theologian” in the Christian Examiner. Promoting the philosophies of German theologian Friedrich Schleiermacher, who had died just two years earlier, Ripley’s paper praised Schleiermacher’s concept of the “religion of the heart” based on intuition and personal communion with God. This defied conventional concepts of religion in New England at the time. About a year after this meeting, Ripley would deliver a scathing sermon criticizing “the inordinate pursuit, the extravagant worship of wealth.” This would put him on the path towards socialism…but as of 1836, he wasn’t there yet. Ralph Waldo Emerson was the second oldest among them at age 33. Born in Boston, he was, being the only one without a pulpit, the odd man out. Emerson’s career had begun brilliantly, graduating with Harvard’s class of 1821 at age 18…a younger age than any of the others at this meeting. He graduated the Divinity School and was ordained as junior pastor at Boston’s Second Church in 1829. His promising career as a minister was disrupted by tragedy and doubt. His young wife died in 1831. He subsequently wrestled with religious questions that led him to resign his ministry in 1832. By 1836 he had regrouped and embarked on a career as a lecturer and writer. His first book, Nature, emphasizing the divine connection between man and all things in the natural world, was due for publication the very next day. The youngest, though not by much, was 29 year old Rev. George Putnam, born in Sterling, Massachusetts. He graduated with Harvard’s class of 1826. He spent a year teaching at a fledgling private academy in Duxbury at the invitation of Rev. Benjamin Kent. Then he attended Harvard Divinity School and graduated in 1830. Later that year, he was ordained minister at the First Church in Roxbury, a position he would retain for the rest of his life. There is no record of the specifics of their discussion at Willard’s Hotel on that September day. But they resolved to launch their club…and launch it soon. Eleven days later, the club held its first meeting at the home of George Ripley in Boston. Ten people attended. Of this group, Hedge wrote, “There was no club in the strict sense… only occasional meetings of like-minded men and women.” The club was thereafter sometimes referred to as “The Brotherhood of the Like-Minded.” Over time, members included Bronson Alcott, Theodore Parker, Elizabeth Peabody, Henry David Thoreau, Margaret Fuller, William Henry Channing and Orestes Brownson, among others. Emerson would refer to it by many names, sometimes calling it the Transcendentalist Club. It was the beginning of what might be the greatest cultural and intellectual movement in American history. And it all began at Willard’s Hotel. The hotel was demolished at some point around 1900. The Cambridge Savings Bank now occupies the site. I’ve passed there countless times…I used to work in Cambridge and ate many a lunch in the building right next to the Cambridge Savings Bank but never knew the significance of the site. I wonder if there is a plaque there. If not, there ought to be. Samuel Eliot Morison, Three Centuries of Harvard, (1986 edition), p. 268. Sigmund Spaeth, A History of Popular Music in America, (1948), p. 54. Robert D. Richardson and Barry Moser, Emerson: The Mind on Fire, (1995), p. 245. Duane Hamilton Hurd, History of Middlesex County, (1890), p. 3. Richardson and Moser, p. 246.